So basically you are saying the script will not work for me? If I am not supposed to select the new current drive in the Old Drive Combo Box, but that is the only option I have, then it will not work? There is nothing else to select. I didn't say that. I told you what you can try. It was only my guess since I don't know what you did to get the system in its current state. You haven't told me too much how you got that new drive and its content, i.e. which software you did use to copy media files and the rest of partition, also how you got the current MM.db database file and did you do anything to it after you moved files to the new drive. Here is the simple fact: the message that you got by this add-on could happen only if you have selected the old drive/path that has the same serial number and the path as the new specified path (excluding the drive letter). So, my only conclusion is that your old drive, i.e. the old C: partition, has the same serial number as the new drive, i.e. the new D: partition. I have not assigned any serial numbers to drives. The D: is not a partition, it is a stand alone drive. It is nothing to do with the old drive, the old drive is still in my laptop. I have not used any drive backup software, I literally just copied the 15,000 files from my laptop to my PC, I haven't copied partitions, I haven't copied partitions or settings. I just drag and drop copied the files from the old location to the new location. Every hard disk should be partitioned to be able to use it, it should have at least one partition and it should be formatted using some file system that Windows recognize it. So, yes, the D: drive is a formatted partition. I also suppose that you don't have C: partition on the new drive, i.e. you have Windows system and the software on the mentioned D: partition, right? Also, every partition on the disk should have a serial number. Maybe you haven't assigned the serial number to your D: partition, but somebody already did. I suppose you got the new disk already formatted, right? If you follow the link that I provided in my previous post, you could see that one user bought a new disk that had a partition with the same serial number as the old one had. How is that possible? Simply, the manufacturer (WD) is using a backup software to create the same partitions on every hard disk that they sell, most probably with a preinstalled software, and their backup software use the same serial number when formatting the partitions. Go, check it out by yourself. Open Command Prompt, type D:, press Enter, type Dir, press Enter and you will see the serial number of the D: partition. Then go to the old computer and do the same for its C: partition. Then compare their serial numbers. If they are the same, the solution is as I suggested - use the VolumeID tool to change the serial number of your partition: https://docs.microsoft.com/en-us/sysint ... s/volumeid. After that you could use my add-on and you will not get the mentioned message box about the same paths. However, if you have the new drive with the same serial number as the old one, and the same folder structure to the media files, then I don't know why MediaMonkey cannot recognize these files. Are they grayed out in the MM filelist with the label of the new drive between square brackets  on the beginning of every path? How about you post a screenshot of the program? What do you want me to package and upload on Dropbox? My whole music collection? Of course not, I don't want your music collection. I told you, you could pack the database file. The MM.DB database file contains only information about your media files, not your media files themselves. Here is its location, if you have the standard installation of program: http://www.mediamonkey.com/support/inde ... -ini-files. But first check the serial numbers as I suggested and let me know if they are the same. Is the problem that the files are already in the new location on the new drive? No, it is not the problem. There was no software used to copy the files, as I said in the last message, I selected the files, I dragged the files, I dropped the files in the new location. Unless you want me to say that I used windows software to copy them? Also as per my previous messages the MM.db was copied from the old database on my laptop. I have checked the two drives as you suggested, C: on my laptop where the files came from has the Serial Number: E65C-*** and D: on my PC where the files are now has the Serial Number: D460-***. So they are not even remotely close to being the same ID. So this confirms as I said before that the only option I get for the Old drive Combo box is the new drive: D460-***. No that's wrong, I have two separate drives in my computer. One is C: this contains windows and software. The other is D: this contains files. Again no, the drive was not purchased pre-formatted. It came out of my old computer and was will have been formatted using the basic windows function. When I load MM the files are not greyed out, it's only when I click to play a track that it works its way through each and every track greying them out. There is nothing in square brackets  at the beginning of file paths. The file paths are showing as the stupid file paths that I mentioned before D:\Users\Name\Music\Users\Name\Music\Users\Name\Music\Artist\Album\Track Name. Yet when I check the path on the Hard drive they are in D:\Users\Name\Music\Artist\Album\Track. D:\Users\Name\Music\Artist\Album\Track. Then when I press ok or enter, it automatically changes it to C:\Users\Name\Music\Artist\Album\Track rather than the D: I selected where the track is. Yes, there must exist software that you have used to copy files. Maybe it was Windows Explorer or My Computer or whatever name that you have below the icon that you started, but you should have used something. You cannot just drag&drop some files, you need to select them in some kind of software. But, that all doesn't matter. The thing is, your database file that you uploaded contains files from a drive with the serial number E65C-**** and your paths look fine, i.e. there are no such things as D:\Users\Name\Music\Users\Name\Music\Users\Name\Music\. Are you absolutely sure that you uploaded the database file that you have copied to the right MM folder? Are you sure that your MM program is using exactly that database file? Just save it as something.vbs and put it in the c:\Program Files\MediaMonkey\Scripts\Auto folder. You will get the message box saying the database location on the next startup of the program. After that you should remove that file or you will get the same message box on every restart. Yes I agree it doesn't really matter, but to me it does as I am trying to understand what you mean. So do you refer to every single icon on your computer as software? So 'This PC' is software? 'Recycle Bin' is software? I have never referred to these as software and it is the first time in 30 years I have heard anyone refer to it as software so it is a little confusing. My process for moving or copying a file has always just been drag and drop, or right click, copy, right click paste. I have never downloaded any software for doing this process. It is all just done using what is already available when windows is installed on a computer. I really am just trying to get an understanding of what you mean. I am absolutely positive that is the database file that was copied to the new computer and to the correct location (C:\Users\Name\AppData\Roaming\MediaMonkey\MM.DB It was copied from this location on one computer and copied into this same location on the new computer. I have run your script and it also gives this location as where the MM.db is. Upon copying the MM.db file into the new computer, the next time I opened MM all my playlists and organisation of MM appeared on the new computer, I would assume this means it is reading from the correct file? Otherwise there would be no way of it having this information? So do you refer to every single icon on your computer as software? So 'This PC' is software? 'Recycle Bin' is software? "Computer software, or simply software, is a generic term that refers to a collection of data or computer instructions that tell the computer how to work"
- select the Medias table and look at the SerialNumber column, (more specifically, pay attention to the rows that have DriveType = 3) -> you fill find the record that have SerialNumber = -4301... which is a decimal for your E65C****; you will not see any record that has SerialNumber = -731... which is a decimal for D460****. If you want to find out what is its hex value, start Calculator software, choose View / Programmer, select Dword, select Dec and paste the number from the Medias table, then you select Hex and you will get the ID number as it is displayed in Command Prompt. How about you post the screenshot of the Update Location dialog box with the list of the Old drive combo box rolled down, so I can see what you really have? Do you have only one instance of MediaMonkey on the new computer? Maybe you have some portable installation on it as well and you installed my add-on to the wrong instance? What do mean by "It was copied from this location on one computer"? Have you uploaded the file to Dropbox from your old computer or from your new computer? I guess it was from your old computer and who knows what you did with that database file after copying it to the new computer to get such situation as you have it now. I asked you to tell me "how you got the current MM.db database file and did you do anything to it after you moved files to the new drive", but you are not giving me any useful information about that and you expect from me to know what is going on with your configuration. Did you have Folder Monitoring enabled after copying database file to the new computer, before you started my add-on? That is a big NO. Did you use Locate Moved/Missing Files after copying...? That is another big NO. Did you use some another script for changing serial number in the database after copying..., e.g. the second one mentioned on the Web page that is recommended to you in another thread? That is also a big NO. You should avoid Folder Monitoring, Locate Moved/Missing Files or any other kind of changing database file after copying it to the new computer and before using my add-on. Yes I am fully aware that a computer is hardware and will not run without software. But as I said, in 30 years you are the first person I have ever known to refer to 'This PC' or 'My computer' as software. Anyone with any knowledge no matter how small, knows that you can drag and drop a file from one place on your computer to a new place on your computer. When you say to somebody it is not possible to drag and drop without software, this is extremely pedantic. You know for a fact that files can be dragged and dropped and there is no reason to ask what software is used when I already told you I dragged and dropped. I did not once say you do not know what you are talking about, clearly you do know more about computers that I do. The first time I have actually doubted you is now, when you have referred me to wikipedia. Wikipedia is not a reliable source, anybody can edit it and it should not be used for checking facts, it is a good place to start for general knowledge but it is unreliable and you should not refer people to it to prove points. There was no contradiction to what I have said, I think you need to look up the definition of Contradiction, you seeing something different on your computer to what I see on my computer is not a contradiction. It is simply we see different things. If I had told you that I only had the option for ID D460, then in another message told you I only had the option for ID E65C, this would be a contradiction. I have never contradicted myself, my information has stayed the same. And where as you are claiming I don't believe you, I do, however you are making it obvious that you do not believe me. Again, I am not saying I don't believe you. I have no idea what a hex value is or why I would want to find out it's hex value. I will attach a screenshot of the Update Location dialog box with the list of the Old drive combo box rolled down, so you can see what I "really have". I don't really need it because as I said I believe you, but how about you attach a screenshot of the Update Location dialog box with the Old drive combo box rolled down, so I can see what you really have? Yes I have only one instance of MediaMonkey installed on the new computer. No, I do not have a portable installation and no, I did not install your add-on in the wrong place. Surely if I had added the add-on in the wrong place, it would not show within MM? No I have not uploaded anything to Dropbox. I have my laptop and PC both connected to a router (no internet connection). I mapped a drive on the PC to access the drive on the Laptop. I highlighted the files, I dragged the files from the laptop and I let go of the mouse button when over the PC folder and dropped them here. What happens when you do this is, it copies the files from one location to a new location. So all my files are now on the new computer. 4) I left clicked on the arrow on the taskbar and left clicked on 'Safely Remove Hardware and Eject Media'. 5) I removed the Removable Disk and placed it into the PC. 9) I received a pop up box prompt saying "Replace or Skip Files: Copying 1 item from removable Disk (E:) to MediaMonkey, the destination already has a file named "MM.DB". I left clicked on 'Replace the file in the destination'. 12) I uploaded the exact same file, that was copied in step 8 and 9 to dropbox. "Who knows what you did with that database file after copying it to the new computer to get such situation as you have it now" Absolutely Nothing! I would not even know how to edit this file, the same file that was copied into the folder on the new computer was updloaded to dropbox. Perhaps you did something with the database file when you got it? I told you exactly how I got the current db file, you just do not understand. Folder Monitoring is NOT ENABLED and never was. This was not a part of the tutorial on how to migrate to a new computer, so why would I do something that I am not told to do? The Locate Moved/Missing Files was not used after copying. I copied the db file to the new computer, I ran your script and I got results that you do not believe. No doubt you will not believe the results even with the screenshot. I did however use the Locate Moved/Missing Files after your script would not work. This was on the advice of a user on these forums called Lowlander. I DID NOT use any other script. I DID NOT change any serial numbers. Once again I DO NOT have folder monitoring. When you say to somebody it is not possible to drag and drop without software, this is extremely pedantic. You know for a fact that files can be dragged and dropped and there is no reason to ask what software is used when I already told you I dragged and dropped. No, I am not extremely pedantic. I just wanted to know which software you used to drag&drop files. There are bunch of programs that could do such thing, starting with your "This PC", then Windows Explorer, Total Commander and so on. They don't behave always in the same way, although they all have the same drag&drop thing. Yes, I see the new drive ID D460-**** in the Old drive combo box of your add-on. You still don't get it what I am telling you. You could see the new drive in the add-on only if your database file on the new drive is different than the one that you uploaded to Dropbox. More about this will be mentioned below. Go to wikipedia or any more reliable site that you trust and find information about it. Just for your reference, the Serial Number of a drive shown in the Command Prompt after Dir command is displayed using hexadecimal numerical notation, or short hex. The value of the same serial number in the SQLiteSpy is displayed using decimal numerical notation. I don't really need it because as I said I believe you, but how about you attach a screenshot of the Update Location dialog box with the Old drive combo box rolled down, so I can see what you really have? I could upload the screenshot, but I don't need that. I already told you how you could check that I am telling you the truth. Just download SQLiteSpy (it is very short program and doesn't require installation), open the database file that you uploaded to Dropbox, follow my other instructions and you will find the record about your old drive with its serial number; you will not see any record about your new drive. More about this will be bellow. No I have not uploaded anything to Dropbox. Yes, you have. You uploaded the database file to Dropbox after my request. More about it will follow. Ok now, this is the most important part of your post. You uploaded the database file to Dropbox from your _removable disk_. That is the database file containing the locations of files from your old drive. Yes, it is the same file that you copied to the new drive, but these two files are not the same anymore. I asked you to upload the file that your MediaMonkey program is using on the new computer, i.e. the database file from the new disk which you obviously altered after copying it to the new drive. How? Well, I don't know what you exactly did to it, you should know better about it. Yes, you are. You uploaded the database file to Dropbox after my request. More about it will follow. YES, you are being pedantic. Again as I said nobody in 30 years has every referred to 'This PC' as software to me. I have messaged numerous people tonight who deal with computers on a daily basis and some who have done for 40+ years and I will not even repeat what they referred to you as for being so pedantic about this. Every one of them said that as soon as I mentioned drag and drop, they would know exactly what I was referring to, and that if I had used external software to windows to drag and drop they would expect me to tell them this. Which of course I would if I had used anything other than the standard drag and drop. Clearly English is not your native language and although you clearly have great computer knowledge, you do not interact with people very often or understand certain English words that you have been using. Why would I want to clutter my computer with extra software to drag and drop files when windows can do it with no hassle? "You still don't get it what I am telling you." Do you mean that I do not understand what you are telling me? Correct, I still don't get (understand) what you are telling me. So if you were to explain this better, what it appears you are saying is that by copying the MM.db from the old location and putting it in the new location. My PC or MM will automatically change the MM.db file? As I thought, there was absolutely no reason for me to know what a hex value is. Again, you wanted me to upload a screenshot because you didn't believe what I was saying. I have proved to you by use of a screenshot, as requested that I was telling the truth. Think about it, why would I lie? Where would that get me? Would it solve the problem? No. So there is literally no reason to give you false information and until you started accusing me of lying, making comments like "see what you really have" I trusted that you were being honest. Making comments like this has made me doubt you, and the fact you are unwilling to upload a screenshot as evidence makes me doubt you even more. If you wanted me to upload proof and could not believe what I say, then why will you not upload proof? Instead you want me to go to the trouble to get a program and look if you are telling the truth. "Yes, you are. You uploaded the database file to Dropbox after my request. More about it will follow." I think you mean, yes, you have. But once again you are being pedantic. You were asking about how I transferred the files to the new computer. I did not use dropbox, the only time I used dropbox was when you requested that I used it. Therefore there is no reason for you to be so pedantic about this. We both know that I sent the file to you that you requested via dropbox other than this dropbox was not used. Windows software or this pc software or file explorer software what ever name you want to give it was used. So what I am gathering from your final comments is that you did not correctly explain. I do not know the inner workings of MM, I am a user. I want to organise my music, I want to play my music. You clearly have a greater understanding of MM and also of programming, creating scripts. Yet when you asked me which file I sent to you, as far as I am aware it is the same file that is on the old and the new computer. I was told to copy this over. Nobody, including you has ever told me that by putting it on a new computer the db file would be altered. If I had been told this straight away, then I could have resolved this issue and copied the copied file so that the updated one would be sent to you. "i.e. the database file from the new disk which you obviously altered after copying it to the new drive. How? Well, I don't know what you exactly did to it, you should know better about it"
Please explain to me how I obviously altered the file after copying? 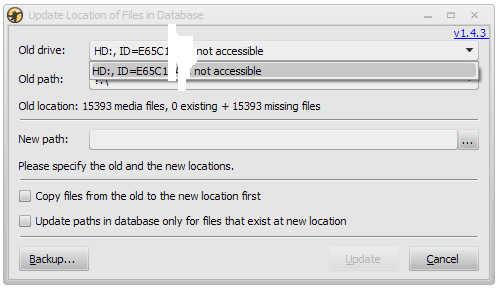 I did not change anything and you have just confirmed that by copying the file to the new location it is automatically altered. This is nothing to do with me (the user), I have not "obviously altered" the file. I have not done anything to the file. If you are saying MM alters the file, then yes the file could have been altered but I know nothing about this. I HAVE NOT ALTERED THE FILE. I would also presume that there will be no apology for accusing me of lying about what I saw in the "Update location of files in database, old drive dropdown menu"? Clearly from my screenshot that I sent you it proves I was not lying to you yet you fail to even acknowledge this or apologise. the fact you are unwilling to upload a screenshot as evidence makes me doubt you even more. I will not comment the rest of your post. You are very rude. You messed up your database file before using my add-on, and yet you blame my add-on for something that cannot be done with it. The further discussion is pointless, I cannot help you. Can you please point out where I have blamed your add-on? I have never said one bad thing about your add-on, clearly it works. There are many people saying it works. I only said I was not getting the options in the drop down box that you said I should have. You did not believe this, I proved it with a screenshot and you still did not acknowledge that I was right and I was not lying to you. No, clearly you can not help as you do not want to help. I have found somebody else on the MM forums who is actually helping instead of calling me a liar. I have not done anything to the database file, as i said, I would not even know how to change the file. I followed the instructions perfectly and the other user has confirmed that the db was corrupted and it is nothing that I have done to it. This is a message to all users of my add-on(s). Contrary to what the previous poster has to say, yes, I am wiling to help with my add-on(s). Always. You could clearly see that in this and other threads related to my add-ons. However, if you want my help, you cannot come here and just say "your add-on doesn't work". You should describe the problem in details. You should describe what you did before using my add-on. And most importantly, I expect that you answer to my questions. If I ask you twice the same question and you still don't want to answer to it, I will not be helpful anymore. I will not answer to someone who write the largest part of posts about things that are unrelated to the problem. Yes, I know I don't speak English well, but you should not play grammar police here. It is not productive. You don't need to mention to me how you have 30 years or so of computer experience expecting that I am some teenager who will be impressed with that fact. It is not productive as well. Your detail explanations of the problem are productive. So please, before blaming my add-on, go check your computer, check the program, check the database file, and if you are absolutely sure that everything else is fine, then tell me how I could reproduce the problem. I cannot know that your database file is corrupted, it is you who should check that. Or you could send me the right file for my examination. PLEASE GO BACK AND READ ALL MY POSTS. I DID NOT ONCE SAY YOUR add-on does not work. In fact, I have said that clearly your add-on does work. Where did i say your add-on doesn't work? Please point me to this because, I simply told you and showed you using the screenshot, that I was not getting the desired results. I also did not play grammar police, if I wanted to do that there was many errors I could have picked up on but I accepted that English is not your native language and tried to explain to you (teach you maybe), correct use of words that you were using incorrectly, or did not know the meaning of. I did not say I have 30 years of computer experience, I told you that in 30 years nobody has referred to 'This PC' or 'My Computer' as software to me personally. This is a fact, I even acknowledge that you were correct calling it software, even if it was pedantic and there was no need for you to do it. So please, before telling people I blamed your add-on, no, I didn't once blame your add-on. I simply came here to find the solution to a problem which ultimately somebody else explained and helped with where you could not help. Can you explain to me how I would know the database file is corrupt? How can I tell you something is corrupt when I do not know it's corrupt. I have been helped with this issue directly by the Peke. We ultimately did not need to use your script to solve the problem. Nothing that you actually mentioned was a solution to the problem I was having and I had to get help elsewhere. Thank you for trying, I appreciate it, but sometimes language barriers can make things harder. No, you should go back and read all your posts. Yes, you said clearly that my add-on works, but only in the last post. Go read your first post in this thread. You are blaming me and my add-on, and my user manual and my English knowledge for all your problems from the very first post in this thread. I was thinking if I should answer to such rude and aggressive post, but yet I tried to be helpful. I spent several hours of my life trying to figure out what is going on with your configuration and you constantly refused to give the answer to my questions, leading the conversation to the unnecessary directions. If I asked you several times to describe how you copied the database file and what you did to it after copying, there was certainly a reason for that. As I explained, there are numerous programs that could copy files, either by drag&drop or in some other way. I cannot know what software you have installed and used for such thing. That is why I am asking about it and that is why you should answer to my questions. It is not because I am pedantic, but because I am not a wizard, nor I have some kind of crystal ball to look at it and to know what is it in your system. It was evident to me that you uploaded the wrong file from the same moment when I downloaded it and installed on my computer. I told you several times that you uploaded the file that your program is not using, I told you that you should send me a file that you have it on the new drive, I even wrote the script that is telling you where is the file that you should upload, I explained how you could check that you uploaded the wrong file using the SQLite software, but yet you doubted that I am telling the truth and requested that I post the screenshot proving that. I am not the one who corrupted your file. It is not my add-on who corrupted your file. Maybe you don't know who did that, but I know about it even less than you. So, the further conversation was pointless. By the way, you should not yell at me. That was extremely rude. Just to let you know, it worked great for me. I keep all my music on an external drive that I back up. My main drive crashed. I plugged in the backup, ran your plugin following the instructions and bam. Was up in and running in less than five minutes. Thanks for all your work on it. I really appreciate it. thank you for your script; it worked for me when nothing else was. Moved MMW to a new windows 10 pc, and even though Gold was updating the new locations, they were lost again. Your script fixed that.